Why is the CMLTO pursuing the regulation of medical laboratory assistants and technicians? CMLTO has repeatedly hears from medical laboratory technologists (MLTs) about changes in the laboratory practice environment. A recurring theme is the increased effect medical laboratory assistants and technicians have on the provision of medical laboratory services. Understanding the effect medical laboratory test results have on patient care underscores the importance of incorporating the professionals involved in the key phases of clinical laboratory testing under the same legislative framework that protects the public via regulating MLTs. impact of changes in the health care system on MLT professional practice. Each of these points is elaborated on in the 2010 CMLTO Position Paper (PDF) on the Regulation of Medical Laboratory Assistants and Medical Laboratory Technicians. Who informed and influenced Council’s decision to make regulating medical laboratory assistants and technicians a priority? 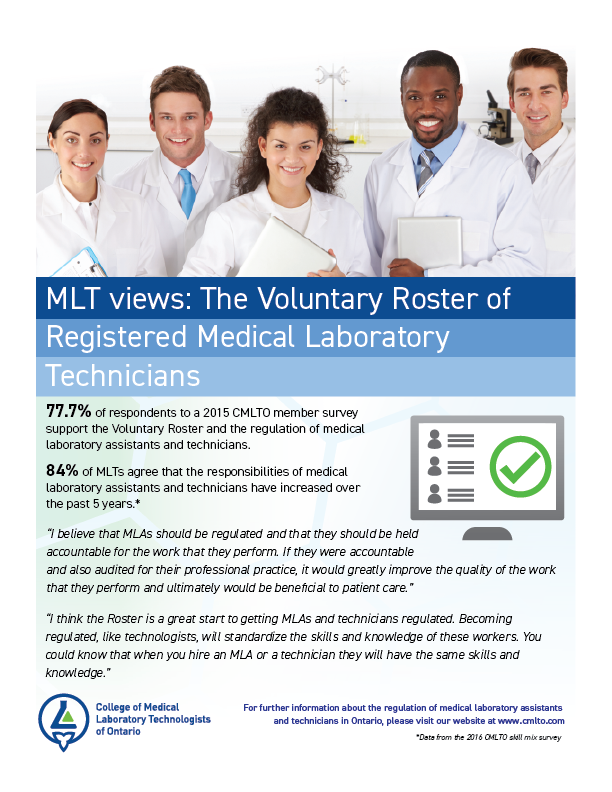 In the 2008 CMLTO Member Survey, approximately 1000 MLTs responded to the two questions related to medical laboratory assistants and technicians. Overall, MLTs supported regulating medical laboratory assistants and technicians. In the 2015 CMLTO Member Survey, approximately 1300 MLTs responded to a question regarding the impact of a Voluntary Roster on public protection and 68% of them believe the impact will be positive. An additional 10% believe that the CMLTO should be pursuing regulation directly and bypassing developing a Voluntary Roster. Only 9% of respondents did not believe the Voluntary Roster would improve public safety and the quality of health care in Ontario, and the majority of them felt that current employer-based competency processes ensure medical laboratory assistants and technicians practise safely. In addition to feedback received by Council and CMLTO staff members during formal linkage sessions, CMLTO continues to receive informal feedback from MLTs regularly via discussions with MLTs, emails and phone calls. Is the CMLTO aware of any opposition to the regulation of medical laboratory assistants and medical laboratory technicians? The CMLTO is aware that some MLTs, medical laboratory assistants and technicians, and other stakeholder organizations are opposed to regulating medical laboratory assistants and technicians for a variety of reasons. CMLTO acknowledges the differing views but is convinced that regulating medical laboratory assistants and technicians is in the public’s best interest. The CMLTO welcomes the opportunity to discuss its reasons for pursuing the regulation of medical laboratory assistants and technicians with any individual or organization, in an open and transparent manner. How is the CMLTO working with stakeholders who have an interest in the regulation of medical laboratory assistants and technicians? Throughout the process, CMLTO has engaged a wide variety of stakeholders through surveys, face-to-face meetings, presentations and electronic communications. The CMLTO will continue with these outreach initiatives to receive stakeholder opinions and input. The CMLTO welcomes the opportunity to discuss the regulation of medical laboratory assistants and technicians with any individuals or organizations in an open and transparent manner. Why does the CMLTO not distinguish between medical laboratory assistants and medical laboratory technicians? The CMLTO has heard from MLTs and medical laboratory assistants and technicians that these are two separate issues. The first is related to nomenclature. We have met medical laboratory professionals who are referred to as ‘technicians’, ‘assistants’, and ‘attendants’ in their workplaces. Currently, to be inclusive, the CMLTO refers to this group of health professionals as medical laboratory assistants and technicians. Secondly, MLTs and medical laboratory assistants and technicians report that regardless of the titles used in the workplace, there is a very broad range of responsibilities which are employer-specific. Therefore, ‘assistants’ in one laboratory may have more responsibilities assigned than ‘technicians’ in another laboratory, and vice-versa. Working towards regulating medical laboratory assistants and technicians necessitates a clear and consistent nomenclature for these professionals, and a clearly defined scope of practice. This will enable clear interprofessional collaboration between MLTs and medical laboratory assistants and technicians as there will be less need for interpretation of scopes of practice. The CMLTO sees the need for clarity and consistency in nomenclature and scope of practice as a fundamental enabler to the regulation of medical laboratory assistants and technicians. On whose authority has the CMLTO expanded its jurisdiction to include medical laboratory assistants and medical laboratory technicians? The CMLTO, like every other health regulatory College, has certain legislated requirements assigned to it under the Regulated Health Professions Act, 1991. Two specific objects of health regulatory Colleges are particularly important to the regulation of medical laboratory assistants and medical laboratory technicians. The CMLTO has a legislated requirement to engage stakeholders to meet its obligations regarding interprofessional collaboration. Via linkage with CMLTO, MLTs have discussed the important relationship between them and medical laboratory assistants and medical laboratory technicians and many reasons for undertaking their regulation. The CMLTO also has a legislated requirement to promote the ability of members to respond to changes in practice environments. The increased impact and participation of medical laboratory assistants and medical laboratory technicians in clinical laboratories affect the provision of safe and effective medical laboratory services. Interpretation of these requirements, along with MLT feedback, clearly indicates the need to pursue the regulation of medical laboratory assistants and medical laboratory technicians. Does the CMLTO suggest that medical laboratory assistants and medical laboratory technicians are not practising in a safe manner? As integral members of the health care team in the clinical laboratory, medical laboratory assistants and medical laboratory technicians affect patient care. In many cases, they are the primary source of contact between the laboratory and patients, as they perform phlebotomy and many of the pre-analytical functions for the laboratory. Published research reports suggest a high proportion of medical errors occur during the pre-analytical phase of medical laboratory testing. The CMLTO recognizes that other factors, external to the participation of medical laboratory assistants and medical laboratory technicians in the pre-analytical phase of laboratory testing, may contribute to these results. However, it is clear that medical laboratory assistants and technicians play a very important role in this process. Based on feedback from MLTs, medical laboratory assistants and technicians, the CMLTO believes the regulation of medical laboratory assistants and technicians will contribute to the provision of safe and effective medical laboratory services. Why do medical laboratory assistants and technicians need to be regulated when the Institute for Quality Management in Healthcare standards contain criteria for entry to practice? Under the Institute for Quality Management in Healthcare (IQMH) standards, as well as the Laboratory and Specimen Collection Centre Licensing Act, 1990, the onus is on the Laboratory Director to ensure medical laboratory assistants and medical laboratory technicians have the appropriate education and preparation to practice. The CMLTO believes that applying the current legislative framework to all regulated health professionals whose practice could have a detrimental effect on patient care is an acceptable, effective process and mechanism for public protection. The CMLTO also believes self-regulation of health professionals ensures they are accountable to the public. The regulation of medical laboratory assistants and technicians will be a multi-year initiative. The process and criteria for regulating a new health professional is clearly outlined by the Health Professional Regulatory Advisory Council (HPRAC). This information can be found on the Laws and legislation page. 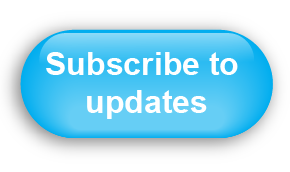 Individuals who register for updates will be notified as any information on the regulation of medical laboratory assistants and technicians is added or updated on this website. 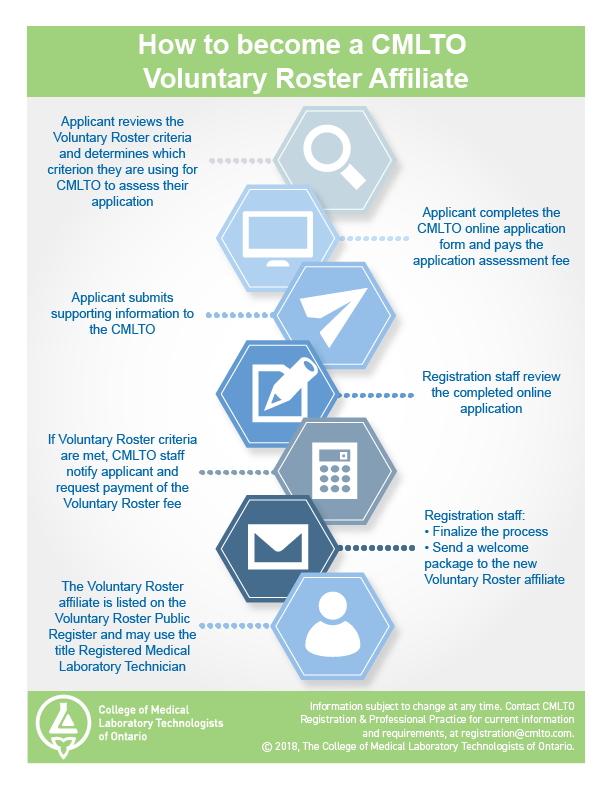 Why did the CMLTO create a Voluntary Roster of Registered Medical Laboratory Technicians? The CMLTO Voluntary Roster enables non-regulated medical laboratory practitioners who meet certain criteria, to demonstrate adherence to a set of clear guidelines. This will establish, for the first time, a standardized way to classify medical laboratory assistants and technicians. Until the time that medical laboratory assistants and technicians are regulated health professionals in Ontario, the Voluntary Roster serves the public interest by confirming that they meet a certain level of educational and professional practice criteria. Those individuals who successfully meet the criteria for acceptance to the Voluntary Roster will be granted access to the designation of "Registered Medical Laboratory Technician." What are the criteria for inclusion on the Voluntary Roster? 1. 1950 hours of general clinical laboratory and/or phlebotomy work experience, acceptable to the VRRC, within the five (5) years prior to application. iii. approved by the Ontario Society of Medical Technologists; and(b) if graduation from one of the programs above occurred more than five (5) years prior to the date of application, 900 hours of general clinical laboratory and/or phlebotomy work experience, acceptable to the VRRC, within the three (3) years prior to the date of application. 3. Certification by the Canadian Society for Medical Laboratory Science (CSMLS) or the Ontario Society of Medical Technologists (OSMT), and, if certification was granted more than five (5) years prior to the date of application, 900 hours of general clinical laboratory and/or phlebotomy work experience, acceptable to the VRRC, within the three (3) years prior to application. 4. The applicant’s past and present conduct must afford reasonable grounds for the belief that the applicant:i. is mentally competent to practise as a medical laboratory technician,ii. will practise with decency, integrity and honesty, and in accordance with the law, ANDiii. can communicate effectively with, and will display an appropriate attitude towards patients and colleagues. 5. The applicant must have reasonable fluency in either English or French. 6. The applicant must not have made, by commission or omission, any false or misleading representation or declaration on or in connection with an application. 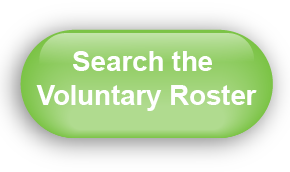 For more detailed information about the Voluntary Roster criteria, please click here. What are the steps involved in applying to the Voluntary Roster? What should I expect if I am successful in applying to the Voluntary Roster? • direct communication with the CMLTO for professional practice advice. Does inclusion on the Voluntary Roster automatically ensure registration with the CMLTO in the future? The entry to practice requirements for medical laboratory assistants and technicians will be described through the process of regulation, and will include criteria relating to education, experience and certification examinations. Until the time that the regulation of medical laboratory assistants and technicians is legislated, the CMLTO Council's shorter term goal was to establish a Voluntary Roster of Registered Medical Laboratory Technicians. Those individuals who successfully meet the criteria for registration on the Voluntary Roster should not expect to automatically become registered with the CMLTO in the future. As registration requirements become developed, so will options to bridge from the Voluntary Roster to registration with the CMLTO. How will the establishment of the Voluntary Roster affect medical laboratory employers? Which certification exam will be accepted as one of the criteria for registration with the CMLTO in the future?